Last week it was the sale of Astroland. 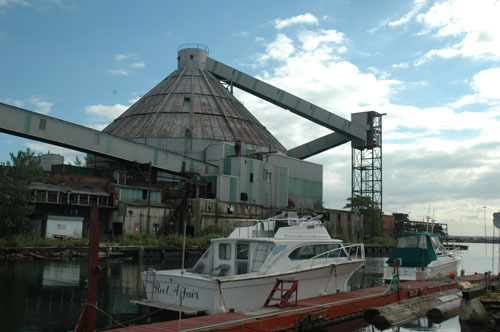 This week, it's the demolition of the Revere Sugar Plant in Red Hook. Curbed got the scoop of the month on the fate of the Revere Sugar Refinery in Red Hook from one of its special correspondents: Demolition permits were issued yesterday and work was authorized to start immediately. (For the permit, click here.) The same developer is behind both stories/projects: Thor Equities. Thor bought the Revere property and has plans to build housing there, although no plans have been made public and no permits are in place. There is, in fact, signficant controversy about whether the property should be converted to residential use or remain industrial. The demolition contractor, Breeze is the same outfit that demolished Old Dutch Mustard in Williamsburg. For an irrelevant look at what Revere might have been in a place where the public sector has regard for reusing industrial sites in a creative way, click here. Unless someone has some secret plan to go to court to stop this, you better get over to Red Hook soon to get your last look at Revere and its dome. These guys work fast. UPDATE: Curbed has photos of heavy demolition equipment on the site and an odd envrionmental van outside. wow. another cool old ruin gone. What will they do with the sunken ship just off the pier? float it, clean it up & put in a TGI fridays?